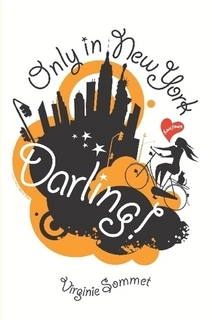 Only in New York, Darling is the memoir of Virginie Sommet and her journey to the Big Apple. Sommet is a French woman who moves to the States to try to make it on her own as an artist. When I was first pitched this book by the author herself in 2009, I thought it would be such a fun read. I was really looking forward to an outside perspective of the American culture, particularly in such an immersion of a large US city. Unfortunately, I simply was not able to make it past page 61. In fact, I set this book aside to never pick up again with such a heavy heart because I have NEVER not finished a book before (unless you count that one time I tried an e-book and was uncomfortable with the format). Why did this book become my first DNF (Did Not Finish)? It was not necessarily because of the content, though I will admit that some of the poetry just plain did not make sense to me. My main reason was due to grammar. It was the most poorly written and/or edited book I have ever had in my hands. Many items a spell checker could have picked up. Others may have been misinterpretations to the English language for it was translated from French. Other issues arose because some words simply did not fit into the text or dialogue. Before you ask, please let me set the record straight because I know where many minds may be going . . . this was not an Advanced Reader's Copy (ARC) or uncorrected proof. If it were, I could have made it further into the book with a greater understanding. However, since I am being honest, I will add this . . . I still probably would not have finished the book. Sadly, it was just not for me. Have you ever marked a book as DNF? Why or why not?